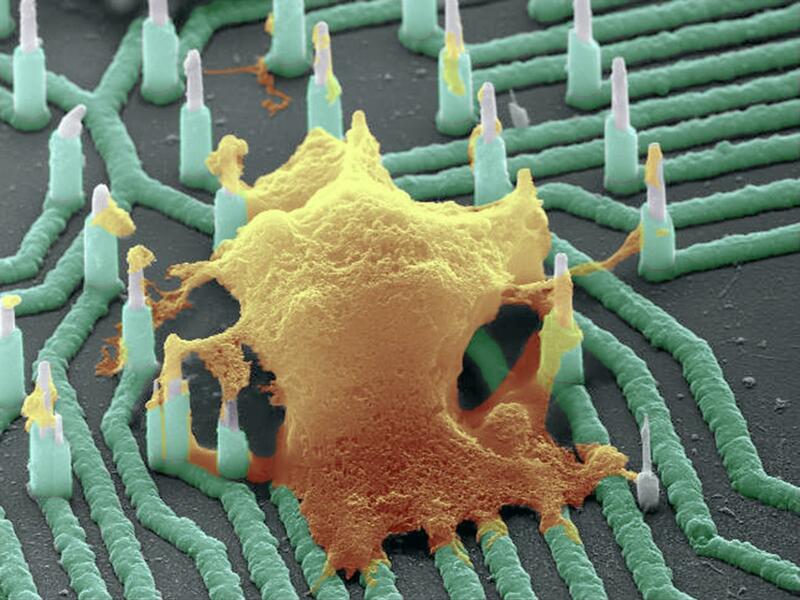 A research team* led by engineers at the University of California San Diego has developed nanowire technology that can non-destructively record the electrical activity of neurons in fine detail. The new technology, published April 10, 2017 in Nano Letters, could one day serve as a platform to screen drugs for neurological diseases and help researchers better understand how single cells communicate in large neuronal networks. The researchers currently create the neurons in vitro (in the lab) from human induced pluripotent stem cells. But the ultimate goal is to “translate this technology to a device that can be implanted in the brain,” said Shadi Dayeh, PhD, an electrical engineering professor at the UC San Diego Jacobs School of Engineering and the team’s lead investigator. The technology can uncover details about a neuron’s health, activity, and response to drugs by measuring ion channel currents and changes in the neuron’s intracellular voltage (generated by the difference in ion concentration between the inside and outside of the cell). It’s nondestructive (unlike current methods, which can break the cell membrane and eventually kill the cell). It can isolate the electrical signal measured by each individual nanowire, with high sensitivity and high signal-to-noise ratios. Existing techniques are not scalable to 2D and 3D tissue-like structures cultured in vitro, according to Dayeh. It can also be used for heart-on-chip drug screening for cardiac diseases. * The project was a collaborative effort between researchers at UC San Diego, the Conrad Prebys Center for Chemical Genomics at the Sanford Burnham Medical Research Institute, Nanyang Technological University in Singapore, and Sandia National Laboratories. This work was supported by the National Science Foundation, the Center for Brain Activity Mapping at UC San Diego, Qualcomm Institute at UC San Diego, Los Alamos National Laboratory, the National Institutes of Health, the March of Dimes, and UC San Diego Frontiers of Innovation Scholar Program. Dayeh’s laboratory holds several pending patent applications for this technology. We report a new hybrid integration scheme that offers for the first time a nanowire-on-lead approach, which enables independent electrical addressability, is scalable, and has superior spatial resolution in vertical nanowire arrays. 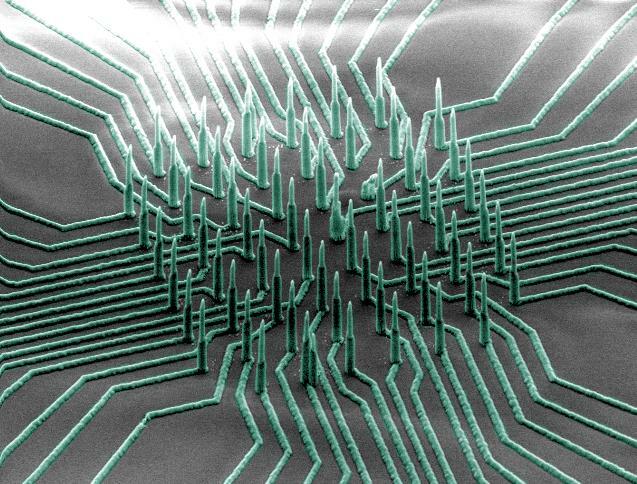 The fabrication of these nanowire arrays is demonstrated to be scalable down to submicrometer site-to-site spacing and can be combined with standard integrated circuit fabrication technologies. We utilize these arrays to perform electrophysiological recordings from mouse and rat primary neurons and human induced pluripotent stem cell (hiPSC)-derived neurons, which revealed high signal-to-noise ratios and sensitivity to subthreshold postsynaptic potentials (PSPs). We measured electrical activity from rodent neurons from 8 days in vitro (DIV) to 14 DIV and from hiPSC-derived neurons at 6 weeks in vitro post culture with signal amplitudes up to 99 mV. Overall, our platform paves the way for longitudinal electrophysiological experiments on synaptic activity in human iPSC based disease models of neuronal networks, critical for understanding the mechanisms of neurological diseases and for developing drugs to treat them.